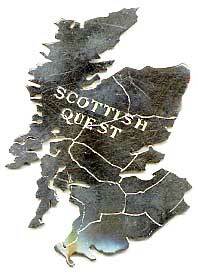 Scottish Quest was written by Charles Cunningham and was released as a series of 20 clues in the newsletters over ten months between October 1999 and August 2000. An extra clue appeared in April 2001. The prize was a sterling silver plate, about 50mm high and 2mm thick, in the shape of Scotland. The each clue was entirely self-contained and offered an insight into the history and geography of Scotland. In the spring of 2001, Shaun Whitehead trekked just across the Scottish border with his brother, to Bentpath near Langholm where he discovered the prize token - a small disk - buried at the base of tree by a dry stone wall. Shaun published his story, and Charles his solution, in the June 2001 issue of the newsletter.